Apex Scaffolding is based on the Fylde Coast in Lancashire, from where we serve the North West of England and beyond. 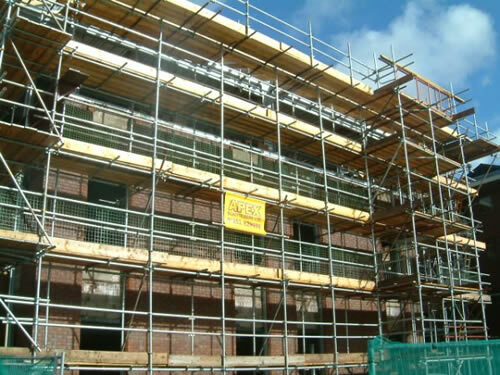 Over the years we have carried out work in every aspect of Scaffolding Services, from working for the private householder to Clients from construction companies, local authorities, county councils, schools, colleges, hospitals, railways, ports, military bases and multinational companies. We have a range of skills from a basic house build through to complex and complicated design work. We pride ourselves on being a highly trained and motivated workforce, keeping up with latest industry developments and operating to the highest standards of health and safety. Take a look at our Trained and Accredited Workforce page for more information. If you're looking for a scaffolding company then look no further. In addition to providing up-to-date skills and services, we also have a very competitive pricing policy.